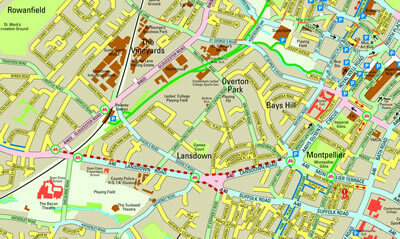 Cheltenham's cycle map sets a new standard in mapping routes for cyclists. Instead of showing only specific cycle routes and other facilities, the map categorises the entire highway network according to the degree of skill and experience needed for cycling. In this way you can select the routes that are best suited to your personal preferences and ability no matter where you want to travel from and to in Cheltenham. So if you're new to cycling, or haven't cycled much for some time, you should start off on the yellow roads where traffic is generally light and speeds low. As your cycling skills and confidence increase, start to use the green roads which may be a little busier and demand more concentration. Only when you are able to deal with heavier and faster traffic should you include the blue and red roads into your routes. The few purple roads demand the highest level of skill but are nevertheless practical routes for those cyclists who have the ability. Although not a facilities map per-se, most cycle facilities in Cheltenham are shown on the Cheltenham Cycle Map (the few that aren't are generally of very low standard and not to be recommended). Signed cycle routes along roads are shown with a blue border. Broad green lines show clearly off-road routes such as the Honeybourne Line and the cycle route across Cox's Meadow. Shared footways (pavements) are shown with a broken red line but should be used only with the greatest care, as there can be many hazards, particularly at junctions. Useful to most cyclists are the considerable number of places in Cheltenham where cyclists are exempt from general traffic restrictions: banned turns, road closures, one-way streets. There are shown on the map with orange bars and contra-flow red arrows. Cycle parking locations are shown with the traditional P symbol throughout the town. The reverse side of the cycle map contains useful information about cycling, including cycle training, and contact details of local cycling organisations and cycle shops.